Are you feeling lost about how to start meal prepping? If so, I’m glad you found this post, because this post is going to teach you the first step to make meal prep easy. Simply put, you must know how to meal plan. One day each week, I sit down and put together a simple meal plan for me and the family. This led me to share this post with you. Think of meal planning as your roadmap to healthy eating. Without proper meal planning, it is like taking a road trip to an unknown destination. If you don’t know the directions to where you’re going, there is a good chance you’ll get lost and head back home. Think of your meal plan as your guide to keeping you on track for the upcoming week without every having the urge to turn back to old, unhealthy eating habits. It makes eating healthy easy. You don’t have to wake up and think about what’s for breakfast, lunch, or dinner! You already know what’s on the menu. This also means less last-minute takeout. You’ll stay on budget. You can eat healthy on a budget. But there is no better way to go over budget than not knowing what you’ll be buying. Your family will know what’s for dinner. Make family time a healthy time! Healthy can and should be delicious! One of the most common questions I get is, “What should I feed my family when I’m eating healthy to lose weight?” You should feed them what you’re eating! After all, why wouldn’t you want those you love to be eating healthy, too? You don’t need to get super fancy when creating a meal plan. This is why some people never get started, because they think it has to be complicated. A pencil and paper with marked out columns and rows works fine. Or, you can print the meal planning sheets I use below. This meal planning sheet is pretty self-explanatory. You simply fill in your meals and snacks for the week. Then, you write a list of what you will need to get from the grocery store to prepare. 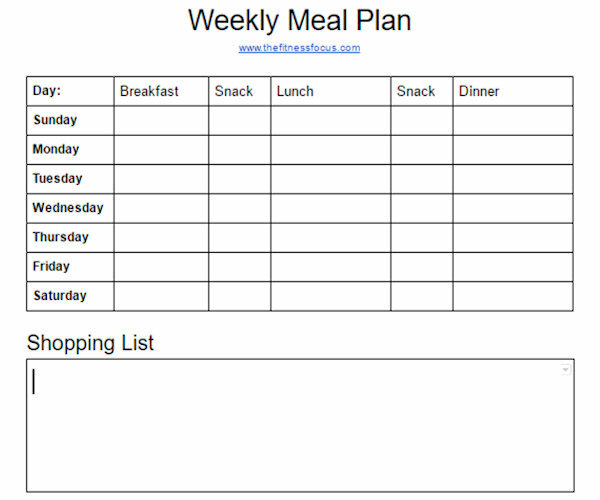 Here is a link to the above generic weekly meal planner with grocery list sheet in Google drive. Click File > Make a Copy to edit or print. Link to an Excel version and a Word version. Link to a pdf file. Print out enough sheets to last you at least one month to save time. If you have been on this blog before, you most likely know I am a believer in whole food nutrition and not huge fan of so-called diets. My motto is to eat healthy in the correct portions, and you will be healthy. I have many posts explaining the 21 Day Fix diet and also have 21 Day Fix-approved recipes and a sample 21 Day Fix diet sample meal plan. I even designed a blank copy for the 21 Day Fix meal plan for people, too. This 21 Day Fix Meal Plan template includes an area to track your containers for each day. Take 10-15 minutes once a week and create your meal plan for the upcoming week. Go through to see what you already have in the house to make these meals. Add any ingredients you don’t have to your grocery shopping list. Go shopping for what you need. It really is that simple! And it’s the perfect way to keep yourself on track. Have a theme for different nights of the week. Growing up, my family had spaghetti and meatball Monday, tacos on Tuesday, and tuna noodle casserole on Wednesdays. This was not to say we didn’t veer from the usual frequently, lol. Now I like to do fish or seafood twice a week, lean white protein 2-3 times a week, and a red meat 1-2 times a week. Plan around the season. For example in the winter, we have more soups, roasted chicken and casseroles, while during the summertime, we do more grilling and more fresh salads. Prep foods immediately when you get home from the grocery store. This will prevent you from pushing what you just bought to the back of the refrigerator and never to be seen again until trash day. And by doing this, you just started successfully meal prepping. Stay on budget by referring to your weekly grocery store flyers. Be sure know your prices, too. Most stores sell some items less expensive, but then mark other items above the competition. By creating a meal plan for the week, you lay the foundation for successful meal prepping – and healthy living. I will go over meal prepping in another post, so be sure to subscribe to the email list below to stay updated. If you have any questions or have any tips to share, please leave a comment below.